is there a way to publish a calendar to friends or to people on the hubzilla network or to any people on the internet? I want to offer an event calender of things happening in our village for others (people on the internet who are not on the hubzilla network) to subscribe. Apparently there isn't a public ical link like I thought (you can only export it?). @poVoq, I will have a look at it and report here. Upper left corner, import/export .ical files. Sure, but this is only a snapshot of the calendar which the 'subscriber' would have to download again regulary to see if something has changed. And I would have to export it each time I have added or changed something. By the way I experienced that only the events up to the displayed month are exported. 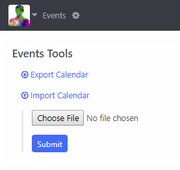 If you want to export the events for the hole next year you have to go to (show up) December and export then.